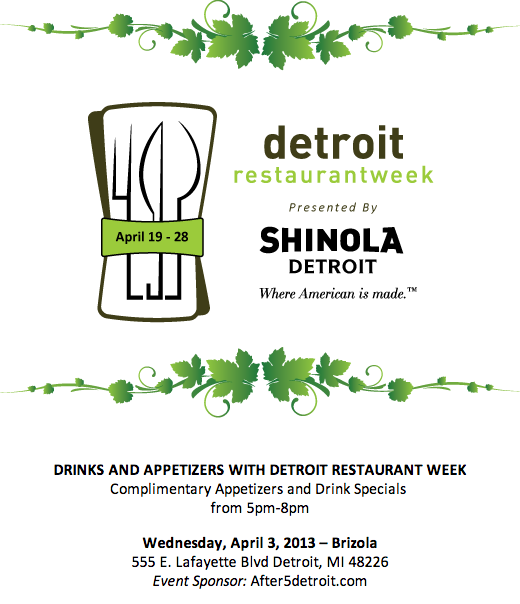 Detroit Restaurant Week is set to return for spring 2013! Beginning Friday, April 19 through Sunday, April 28, Metro Detroiters will once again be able to enjoy hearty three-course meals for just $30 per person. This year's spring edition of Detroit Restaurant Week will be the eighth time the promotion has been offered since the fall of 2009. The first "Drinks & Appetizers with DRW" happy hour event is coming up on Wednesday, April 3. Join DRW for a lively atmosphere, drink specials and complimentary appetizers with After 5 Detroit at Greektown Casino Hotel's luxurious centerpiece, Brizola! Time: 5 p.m. until 8 p.m.